The results of DonationCoder's NANY 2017 -- New Apps for the New Year -- annual event have just been posted on the official website. The event, a tradition started in 2007, is a friendly get-together of coders from around the world celebrating the new year with a bunch of program, app and services releases. All items released as part of the event are provided for free by their developers. This year saw the release of plenty of apps for Android, and a good chunk of Windows desktop programs as well. You can check out the announcement over on the DonationCoder website for additional information. DonationCoder Quick Links -- simple app to improve DonationCoder navigation on mobile devices. 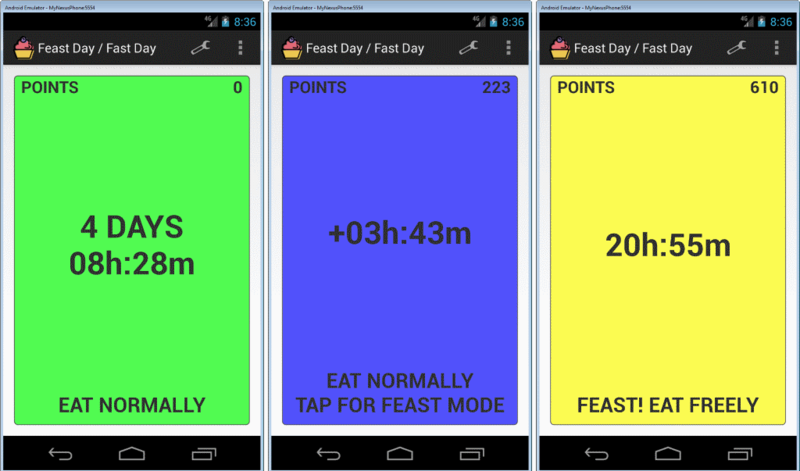 Feast Day / Fast Day -- a diet application that suggests a rather interesting cycle. Eat normally for five days, feast on the sixth, and fast on the seventh. This particular diet worked really well for the creator of the application. Feast Decreaser -- It shows you the eating mode you are in, but instead of going by a schedule, it goes by your current weight instead. You may set target weights for the different modes. MemoList DC -- Create textual notes. Supports categories, widgets, synchronization, and sorting. CheckList DC -- A checklist app that you can use to create checklists (doh!). Supports the same feature set as MemoList DC. Progress Bars of Life -- Android version of the Windows program. Shows visual progression of events from start date to finish. Affirmator -- Shows affirmations that you add to the program. Amortization Calculator -- Freeware calculator that does gives you a run down on loans, interest rates, and the time it takes to pay the money back. Command Blocks Warlock -- Store Minecraft block commands. CSearcher -- portable search program for Windows supporting filters and more. Dia4 and Dia5 -- file explorer proof of concepts. Drive Letter Tool -- visual hints for how drive letters and drive names are displayed by Windows. EOLConverter -- convert line endings from Unix to Windows. Inline Calculator -- a popup calculator for Windows. Mouse Shake Menu -- Execute keyboard commands with the mouse. OpLop for Windows -- gui frontend for OpLop Library that generates passwords based on nicknames and a master password. ScratchPad -- a note taking software that saves data automatically. Screen Capture by Handle -- Capture objects (buttons..) by their handle ID. SLyrics -- lyrics search app using ChartLyrics API. SPinger -- ping large lists of IP addresses to get their status returned. Tiny Server Inventory -- Keep track of servers using this simple database program. TrackFiles -- Tracks changes in a file. Ships with options to compare the changed version to the previous one. TrayLang -- switch keyboard language layout using this too. WaveMe -- a digital electronic timing diagram drawing software for Windows 7 or newer. Auceps -- a single-player game based on "let's catch the lion". BackseatSiege -- a plugin for the QuorraBot chat client for Twitch. SLogo -- run turtle graphics in the browser. Thanks for posting about our event, Martin! Thanks for posting the NANY 2017 roundup! It must be very well written to handle running on Windows with little modification! When last is a nice little program but I don’t see any update having been released in the last year. My version is 2.15, released on 12/31/2016. I have auto update on in Google Play and nothing has come down for this app. It really could use some updates. For instance you need to manually backup your data or you will lose everything when you rebuild your phone. And the backup script is cryptic, requiring you to choose an existing Android directory. It does not appear that there is any way to create a new directory. I use it to remind me to check the oil level and tire pressures on my car. Thanks, DonationCoder has some really useful tools on their site. This is very weird Martin. It appears as if you removed your previous mention of the Windows “When Last” app AND my associated comment that noted that there had NOT actually been any updates to this app as you thought there had been. Huh? How did this happen? Something is not quite kosher! I deleted the new article, and redirected it to the old. It simply did not make sense to have two up that did the same. I don’t understand your reply. Are you saying that there was a v2 article that eliminated mention of the “When Last” app after I noted that it had not been updated? And since the app mention was removed, there was no reason to keep my comment in place? If so, I don’t think you should do something like this as it comes across as revisionist after the fact when there really wasn’t anything to hide from in the original article. Everyone makes mistakes. But if you are going to do this again (because hey, it’s your blog and you can do what you want), then it would be nice if you put a note at the bottom of the article stating what you revised, just as newspapers do when they correct mistakes. You are right, I missed the comment. Have moved it to this article. Your contact link is missing from the new website design. Also, when I refresh your websites, most of the time I lose your formatting. Sometimes clearing the cache will fix the problem but many times it does not (like now). I am on latest FF ESR release. Last, you don’t seem to remember my name or email address and I have to type then in whenever I post a comment. Jojo, thanks for your report. The contact link is in the footer. I have added the two other issues as a bug report.